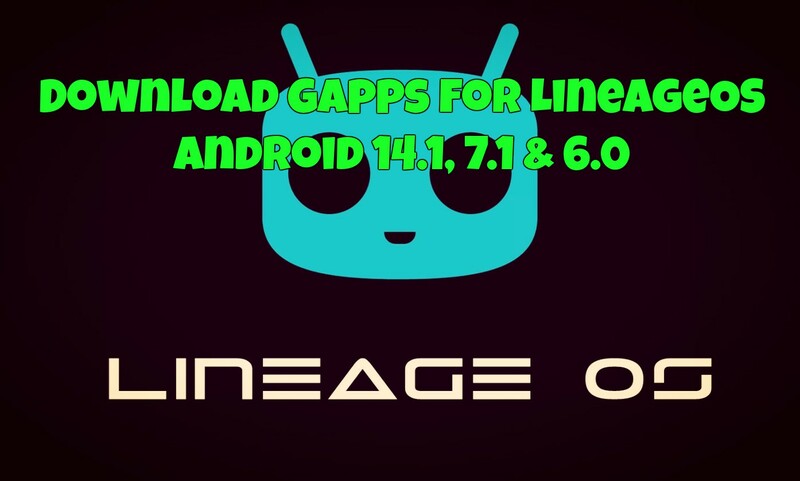 Here in this guide, we are providing all the details to Install and Download GApps for LineageOS Android 14.1, 7.1 & 6.0 Android Custom ROMS. Cyanogen discontinued their project and transitioned CM into Lineage OS. So that means all the new ROM come with the new name LineageOS. Most of the developer started working on the LineageOS custom ROMS and to flash these custom ROM you need to install the Gapps for LineageOS ROMS. So that why here we are providing all the details about LineageOS Gapps. Why do you need Gapps? As you guys know that LineageOS ROMS or any other custom ROMS don’t come with Google services pre-installed, so you need to flash these Gapps manually on your phone to enjoy all the Google services on your phone like Gmail, Play Store, Youtube, Google Search and all. To install the same, you need a phone with Custom recovery Like TWRP or CWM. After that, you can install you fav ROM and Gapps on your phone. Below you find the guide to Download GApps for Lineage OS 14.1, 7.1, and 6.0. These Gapps comes in a diffenrt package and different ROMs like Nougat, Marshmallow and Lollipop. Here you can find all the download link to download the Gapps on your favorite custom ROM. So let us get started and download Gapps for the Android custom ROMS. This Gapps package comes with all Google Apps that come pre-installed on the Nexus 6P and 5X. It comes with the popular Google apps, plus some more apps that aren’t up for download on the Play Store. Comes with Gmail, Calendar and Google Search (Now), plus some more apps that aren’t up for download on the Play Store. Comes with some of the Google apps like Gmail, Plays store, etc. 1) First, download Lineage OS Gapps from the above mention links and save it on your phone. 2) Now boot your android phone into Recovery Mode to flash the Gapps. 3) Now from the custom recovery click on ‘Install’ and select Gapps package. 4) After selecting the Gapps simply flash the zip file. After that clear cache and Dalvik Cache. That’s all. With this guide, you can download LineageOS Gapps on your phone and install the same.Comment below if you have any doubts.